I’ve recently gone through my archives for a project I’ve been working on and noticed that, by and large, my posts are positive snapshots of my life and about people and things that inspire me. For some of you, the people who have known me for a long time, may be wondering who I have become – if I’ve swallowed some sort of yoga kool aid. For those of you that are new to me or only know me through this blog, I want to be clear this is, in no way, to be taken as an accurate picture of my day-to-day life. Lest you get the wrong impression about me and my life – everything isn’t always swell and great and easy. It is not. In fact, August was one of my most emotionally draining months ever. I’m just not interested in airing my dirty laundry on the internet or putting my still-in-progress troubles out there for the world to see. It’s not how I roll. I’m more of a work things out by myself/with a close friends/counselor kind of person. In this space, I choose to highlight the awesome things I do every month because if I didn’t, these amazing things would go unnoticed and unappreciated. Mostly by me. My natural tendency is to see what is wrong in a situation – to find the pieces that don’t fit and to make commentary on those (sometimes in a really funny way, if I do say so myself)- leaving my brain filled with the impression nothing in life is quite right. Don’t get me wrong, I like this part of myself. Both for the observational humor as well as the I like to fix things part. But here’s the thing, my brain sometimes gets stuck in seeing what is wrong in life and I’m raising a kid now and I don’t want to nit pick life in front of her. Or nit pick her. So pointing out what is going well – however small it may be – helps me notice the awesome things in my life. Much to my surprise, I’ve also figured out that I like seeing the beauty in the smallest things. It really does fill me with a sense of wonder and gratitude (I know, I may also have thrown up in my mouth a little bit too). 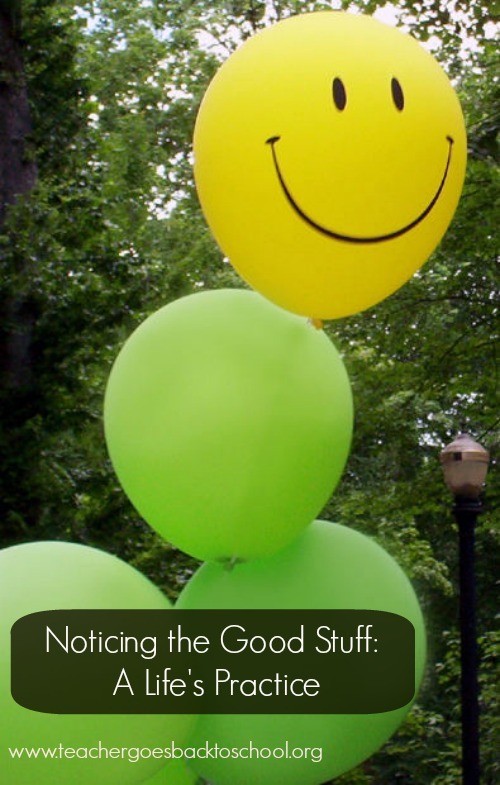 Noticing the good stuff, my friends, is a practice for me. Much like yoga and meditation are things I have to practice – do a little each day in the best possible world – in hopes that some day it becomes an actual habit or something that comes more naturally. Do you take time to notice the good stuff in life? Do you share your life online? How do you deal with this issue? This entry was posted in A Yoga Story and tagged daily practice, grateful, gratitude, honesty, little things, practice, truth by Teacher Goes Back to School. Bookmark the permalink. I admire you and wish I could follow your good example. Not today! MoulinRose: I hope your day got better. The good news is every day is a chance to start over. Hit that reset button.